We would love to custom build for you. We see every new home as a chance to create a stunning space that goes above and beyond your imagination and expectations. See our plans now. Energy efficiency is built into every BUILT GREEN® home we build. The level of efficiency varies based on your budget and commitment. We build creative, beautiful, eco-friendly, energy efficient and functional homes that improve the quality of life for individuals and families. Our philosophy reflects our work ethic, one of socially responsible building practices. Whether you’re buying your first home in and around Edmonton, or need something larger, our designs and floor plans are sure to meet your needs. We believe your custom designed home is a very unique experience. Our expert project management professionals and designers work together as a team, to ensure your satisfaction. The result is that you end up with a home that rises above your expectations. That's our promise and unwavering commitment to quality through a disciplined approach to construction. Our custom homes are a distinct reflection of your vision. All are a testament to our standard of excellence. If you choose to build with us, we will ask you or your family to participate in the construction process. We ask you to share your ideas, thoughts and sketches - and we will share ours with you. When we feel we know and understand each other, will we begin to design and plan together, in a spirit of true partnership that extends to the last finishing detail and beyond. New Capilano Home Available For Sale in Edmonton! Compact yet contemporary and soooo stylish, this modern 2,011 sq.ft. 2 ½ storey home is situated in one of Edmonton’s desirable mature neighbourhood, with easy access to the river valley and downtown. 2011 sq.ft. modern 2 ½ storey home with sunken courtyard. Complete with 735 sq.ft of developed lower level with 9’ ceilings. 3 bedrooms plus bonus room and exercise room in lower level, 3 ½ baths. 3rd floor roof deck with amazing river valley / downtown views. Read More! This stunning 2011 sq.ft. 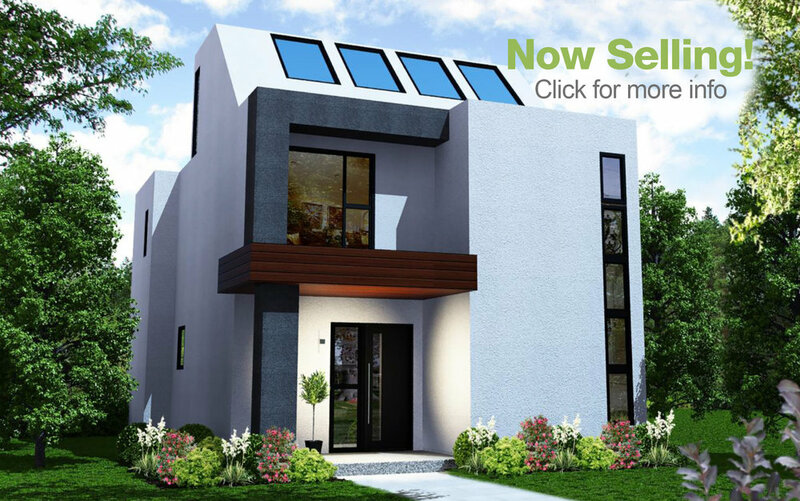 modern 2 ½ storey home has a number of exceptional features including a sunken courtyard., 9’ lower level and main floor, 3 bedrooms plus bonus room and exercise room in lower level, 3 ½ baths and so much more. Nestled in Edmonton’s river valley park system, this home boasts river and downtown views. Possession: summer 2018. 2 Future Homes In The Capilano Area With Breathtaking Views of the River Valley / Downtown. Within Minutes of Downtown.